﻿ James Rodríguez: "Cristiano Ronaldo is a great person"
11.08.2014 » James Rodríguez: "Cristiano Ronaldo is a great person"
No other player has probably had such an impact in the past World Cup as James Rodríguez did. Following several consecutive stellar performances, the Colombian star led his national team straight into the tournament's quarter-finals and ended up triggering Real Madrid's interest in him. 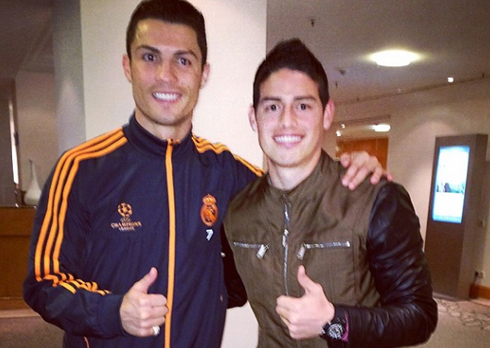 In Spain, James will meet Cristiano Ronaldo, one of his biggest idols in sport. James Rodríguez became Real Madrid's biggest signing of 2014 a few weeks ago, after the club decided to pay AS Monaco close to 80 million euros for the 23-year old. After having become the top scorer in this summer's FIFA World Cup, where he scored 6 goals in 5 games until he exited the competition in the quarter-finals round against the host nation Brazil, the Colombian superstar has now embarked in a new adventure in Spain. In an interview granted to a big Colombian newspaper called "El Tiempo", James Rodríguez talked about his new teammates, as well as his expectations for the new season. The talented midfielder had also no problems in expressing his admiration for Cristiano Ronaldo, whom he considers a great person. The two stars will probably have their first chance to play together this Tuesday night, in a Real Madrid vs Sevilla clash that will take place in Wales and that will decide who will take home the UEFA Super Cup trophy. When a player arrives to a club like Real Madrid with a price tag set around the 80 million euros, it's more than normal to assume that he'll quickly become one of the key payers in the team. That's the kind of pressure that James Rodríguez will have to deal with in the months ahead, as he'll try to impress and convince not only his new coach and teammates, but also the very demanding Madrid fans and the ferocious Spanish press. James Rodríguez: "I'm extremely calm right now and I'm well aware that I've arrived to a very big club. 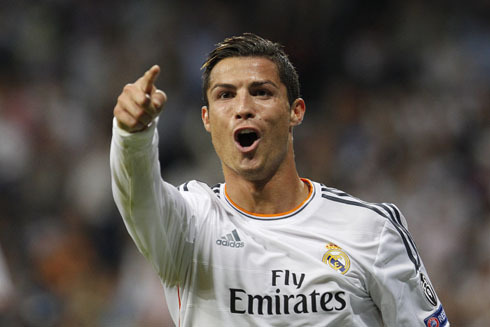 Real Madrid is constantly aiming to win games and trophies, but that's something with which I'm perfectly identified. For now, I just want to help the team winning and by doing that, collecting more trophies", started by commenting the former FC Porto and AS Monaco midfielder. With Real Madrid taking on Sevilla later this Tuesday and James Rodríguez having his starting spot already almost assured, we'll get to see the Colombian star in action next to his new teammates sooner than many had initially expected. The Merengues will most likely lineup a midfield formed by Luka Modric, Toni Kroos and James Rodríguez, but at this stage of the season, it's quite hard to preview how these three men will link up with the attacking trio in front of them (Bale, Benzema and Ronaldo). 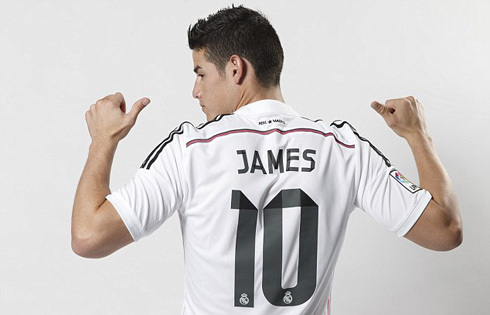 James Rodríguez: "Everyone made me feel very welcomed since I got here. First and foremost, they are all great people. That's very important in my opinion and that's the reason why I admire them so much. I'm surrounded by many great players and they are all very humble. That's probably also one of the reasons why they are here in Madrid. I just want to be another player in this team and someone who is ready to help and give his contribute whenever it's necessary", explained the 23-year old midfielder. The Colombian star then spoke a few words about one of his biggest idols in this team, the former Manchester United winger, Cristiano Ronaldo. 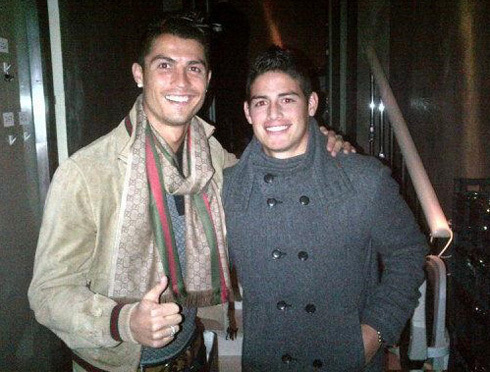 James Rodríguez: "Cristiano Ronaldo is a great person. We share the same agent in football, Jorge Mendes, so fortunately I already had the chance to meet him in the past. It's normal to see such great players here in Madrid and I know we're all going to have to be ready to compete for a starting spot from the very first day of the pre-season", concluded Real Madrid's new number 10, who will be given his first opportunity to showcase his talent this Tuesday in Cardiff (Wales), in the UEFA Super Cup final between Real Madrid and Sevilla. Cristiano Ronaldo next game for Real Madrid will be against Sevilla, for the UEFA Super Cup final, scheduled for August 12 (Tuesday). You can watch Juventus live stream, Real Madrid vs Sevilla live stream, Barcelona vs León, Manchester United vs Valencia, and Chelsea vs Real Sociedad, all matches provided from our live soccer pages.